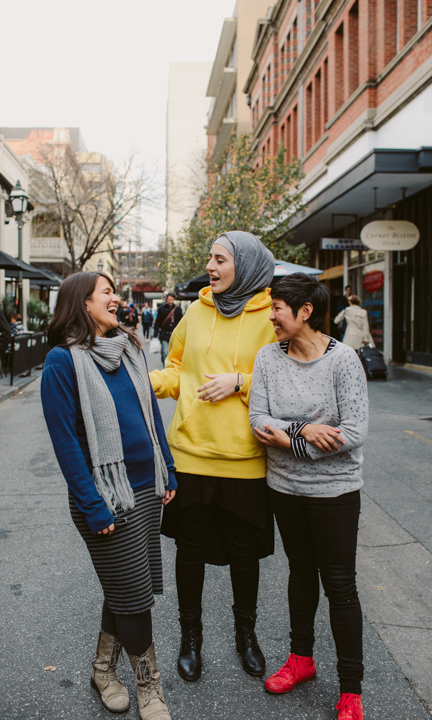 Associate director of ActNow Theatre, Yasmin Gurreeboo, has launched Theatre of the Global Majority, a workshop series aimed at increasing diversity within South Australia's theatre community. As a person of Islamic heritage growing up in the UK, Yasmin Gurreeboo was keenly aware of the lack of diversity represented on screens and stages. Theatre of the Global Majority is a fortnightly workshops series running from 6pm until 8pm on Thursdays. The next workshop will be held on 2 August at Level 2, Station Arcade, 52 Hindley Street. By the time Yasmin became active in the industry, things had improved, but she still felt a responsibility to work toward greater representation, and so, as a performer, and while working in behind the scenes roles, she made a point of championing the voices and talents of other artists of colour. Since moving to Adelaide in 2012, Yasmin has persisted with the cause, both through the theatre company she runs, Foul Play, as well as with ActNow Theatre, a self-proclaimed “socially conscious theatre” company where she is the associate director. Even today though, the Australian arts industry is still at a “fledgling stage” with regard to representation, she says. This issue is not only present on-stage; through putting together shows in Adelaide, Yasmin noticed that, as adamant as she was about casting diversely, the pool of talent she had to draw from often lacked diversity. “I was trying to cast a woman of colour in the lead role for the show I was directing, and it was really, really hard to find anyone within that age bracket and with the skills,” she says. Yasmin Gurreeboo, Mahira Hasanović and Valerie Berry. Yasmin’s fix is grassroots – carving out a space for emerging artists of colour where they can develop their skills and build a community. Yasmin teamed up with fellow artists Valerie Berry and Mahira Hasanović and devised a fortnightly workshop series called Theatre of the Global Majority. “We just don’t have enough artists working in the industry,” she says. “And also… platforms [where performers can] develop skills or make work, we’re just massively underrepresented, and that’s been a big bugbear of mine. And that’s Australia as a whole; it’s not just specific to South Australia. Performers attending Theatre of the Global Majority will be taken through exercises designed to upskill them, but Yasmin says the workshop will focus heavily on creating. “It will be very responsive to the participants, but initially it will be who are the group? What are the needs of the group? What skills should we develop? What needs to be developed? How do we develop actually sharing our stories and our voices?” she says. “Being able to articulate our stories is really important… and then straight away trying to think about making work,” she says. Yasmin admits, “it’s a long-term thing, it’s not going to be something that’s done in six months,” but she hopes that through Theatre of the Global Majority, she will build a network of artists of colour who she can then employ through Foul Play and ActNow, as well as showcase to the broader South Australian, and even national industry. “I hope we have more artists of colour that we can work with, and casting agents, State Theatre, all the other companies can actually draw from this pool,” she says. “[And] it’s really important that communities have ownership over their own storytelling, and by doing that, it can broker something. It changes how people perceive certain communities as well, by hearing those stories from those communities, as opposed to a white perspective telling those stories.